Noah- I found this show to be very satisfying. To hear Jerry shine while his health was clearly deteriorating shows how strong of a musician he truly was. On another note, I have a theory on Garcia's voice in the 80's. While it is indisputable that his voice was declining up through '86, I believe that it evolved into a sweeter, deeper tone after his coma. The raspiness was gone and replaced by a unique smokiness and depth that, in my opinion, added a beautiful, serene quality to his voice. This is especially evident on the JGB shows from late in that decade and the early '90's. This may just be me on this one but I was turned on to '80's Dead first and I just have an affinity for this post '86, pre Brent's passing era. Anyway, thanks again for all of your work on the Guide. 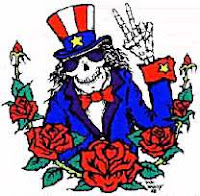 You have made me one smiling Deadhead :) Any chance for a late '80's show for review?? Glad to make you smile, arch23mt. You make a good point about Garcia's voice. I think, despite how his voice changed physically, nothing could remove the emotion he was able to convey in singing. He was a master in all stages of his career. I was at this show, which was pretty high-energy. The Promised Land that ends set I was unusually rockin', and listeners will notice that when JG's line at the end is not only late, but roaring. Turns out he seemed to forget that it was his turn to contribute, and he rushed up to the mic, actually bumping into it. He looked slightly confused for a second, then howled the lyrics. It's as energetic as any of his deliveries in that tune I've heard. So that's the story. I concur that the China/Rider may also be the best of the year. Don't write 1986 off completely. From that same tour the Hampton Shows were good shows and the crowd reaction when they broke loose with "Box of Rain" still gives me goosebumps - 1st time in something like 14 years. If you haven't listened to 3/20/86 recently at least pull down the Box and see if your opinion can be changed. For me 87 and 88 in general were weaker than 86 in general although there are exceptions of course. BTW, great work. Love the blog. It's helped me discover shows I never would have found. If you recommend it, I'll listen to it. two nights before (3/25/86) was probably the sweetest Brokedown I've ever heard...check it out. WHen he sings "on the banks green edge" he starts the phrase on high notes for "on the banks" -- it is really touching. I've never heard him do that in any other version, and it absolutely hits the spot. check it out on archive. 3/25. I just got soundboards DIRECTLY from the vault,.......SERIOUSLY....so if anyone needs a copy,let us know. "and just keep truckin' ON!!!" I would give this evening an extra praise for this roaring monster that Revolutionary Hamstrung Blues is. I wish they had played it more often, worked on it and found out, what that song could evolve into. But maybe it seemed to aggressive around that time. I wish I knew why they dropped it. OK, many might say: "because it was not good", but I think it was good, it was just new, Cyberpunk Grateful Dead driven by weird energy. I have the feeling they knew what the song required, and it explains the energetic playfulness of that first set. 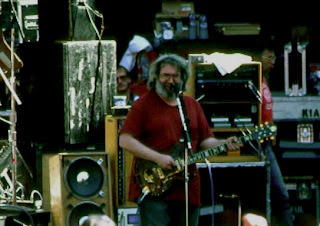 also, for some reason, I thought Jer's voice was markedly better than '84-'85 (don't know why, but sounds that way to me), and really until the summer tour I thought Jerry was slingin' some grate geetar as well!